Profiteroles is a fancy name for choux pastry, baked into little buns then split open and filled with custard or sometimes even ice cream. A drizzle of caramel or chocolate sauce finishes this fancy dessert that can be made with ingredients most people keep on hand. This week our Sunday Supper group is sharing a wonderful varied bunch of budget friendly recipes. 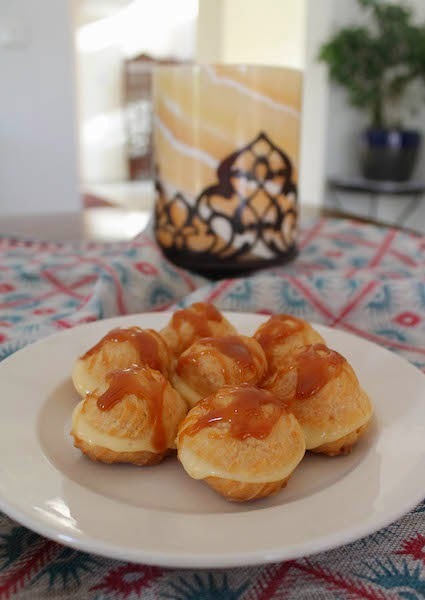 As I was browsing through my cookbooks and the internet, I was suddenly struck by the idea of profiteroles because, despite their fancy looks, they are made of choux pastry with normal ingredients most folks keep on hand anyway– butter, flour, water and eggs - that don’t cost a fortune. And if you fill them with traditional custard, that’s just milk, flour, sugar, eggs and butter - more staples that won’t break the bank. You certainly don’t have to, but if you top them with homemade caramel sauce, that’s easily made by caramelizing sugar and adding milk! 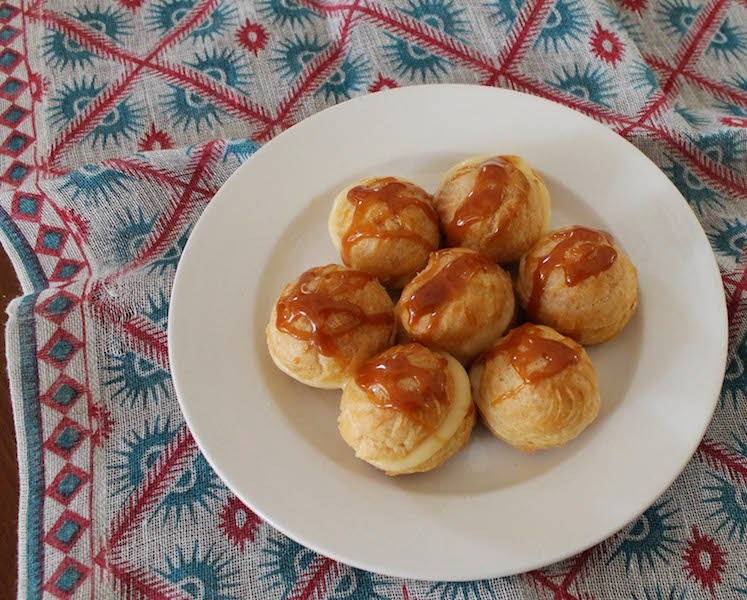 I find it quite amazing that we can take pantry and refrigerator staples – none of them expensive items - and transform them with heat and time into something as special as profiteroles. 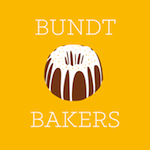 Make sure to scroll down to the bottom of this post to see the links to all the other wonderful Budget Friendly recipes we are sharing today. Many thanks to our hosts for this great theme, T.R. of Gluten Free Crumbley and David of Cooking Chat. N.B. 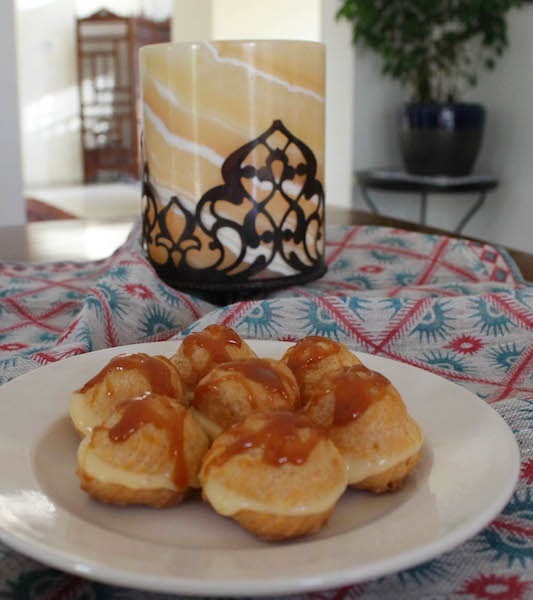 I won’t repeat the instructions for the caramel sauce since you can find them here on Confessions of a Bright-eyed Baker, whose recipe I used. Follow her directions to cook the sauce a little longer for a thicker caramel. 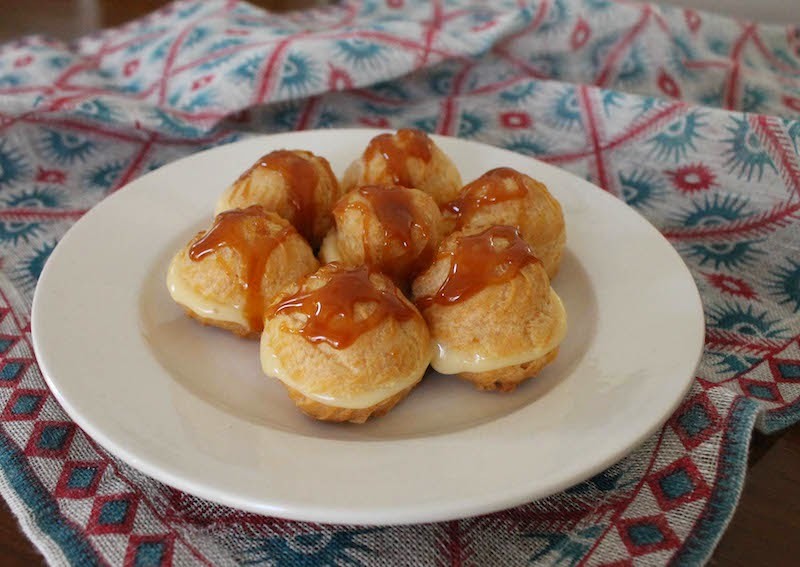 Make your caramel sauce ahead of time to make sure you are not distracted by choux pastry baking in the oven or custard thickening on the stove. (See link in note just above.) It will require your complete concentration. Set it aside to cool. Next comes the custard. In a small saucepan, either not on the stove or with the stove turned off, combine sugar, flour and the pinch of salt. Stir in your milk, a little at a time, whisking until smooth. Turn on the stove and bring your mixture to the boil over medium heat, stirring constantly. Boil 60 seconds and then pour about a 1/4 cup or 60 ml of the hot liquid into the two beaten egg yolks while you whisk constantly. This warms the egg yolks so they don’t cook when you add them to the saucepan. Need a visual of how slow to pour and how fast to whisk? It’s not the best but it will give you a good idea. Now add the heated egg yolks to the saucepan gradually, once again, stirring all the while and then keep stirring until mixture starts to bubble again. Your custard should be quite thick now. Remove from heat and add the vanilla and butter. Stir well until the butter is melted and both are fully incorporated. Put the custard in a bowl and cover the surface with cling film so a skin doesn’t form on top as it cools. Chill in a refrigerator. Tip for making nice even profiteroles: Use a circle template or bottle cap that is about an inch or 2.5cm in diameter to draw circles with a pencil about an inch or 2.5cm apart on the back of your baking parchment. Turn the parchment over and stick it down to your baking sheet with a quick shot of non-stick spray. Preheat your oven to 445°F or 230°C and prepare your baking sheet by lining it with parchment paper stuck down with a little non-stick spray – with or without circles drawn on the bottom. (See note just above.) I have a small baking pan so I had to prepare two. Now let’s get on with the main attraction, the choux pastry. Sift together your flour and a pinch of salt and put the bowl right next to the stove in readiness. 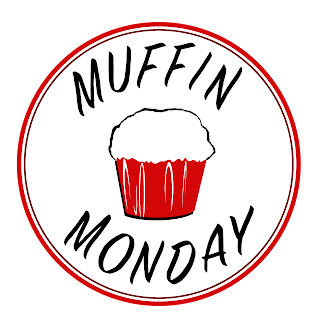 Bake in your preheated oven for 10 minutes then turn the temperature down to 400°F or 200°C and bake for a further 25 minutes. Remove from the oven and allow to cool completely. The dough makes about 50 choux buns. 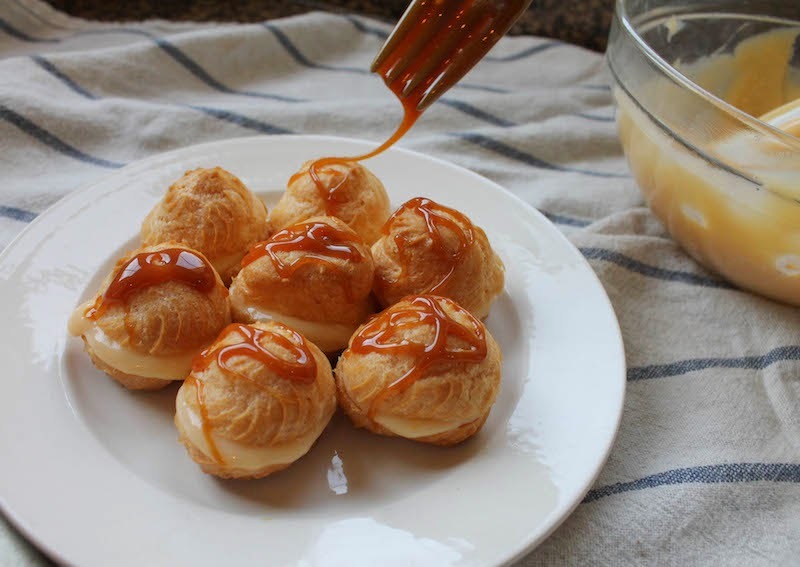 When you are ready to serve the profiteroles, cut the completely cooled choux pastry buns in half with a serrated knife and fill them with the chilled vanilla custard. I used a piping bag for this as well but you could also just spoon it in. Pop the tops back on the choux buns. Drizzle with a little of your caramel sauce. You may now call them profiteroles! Store any unfilled choux buns in an airtight container where they will stay nicely for several days. 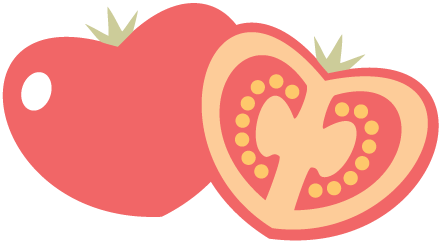 Looking for tasty recipes that won’t empty your wallet? This is your Sunday Supper week! 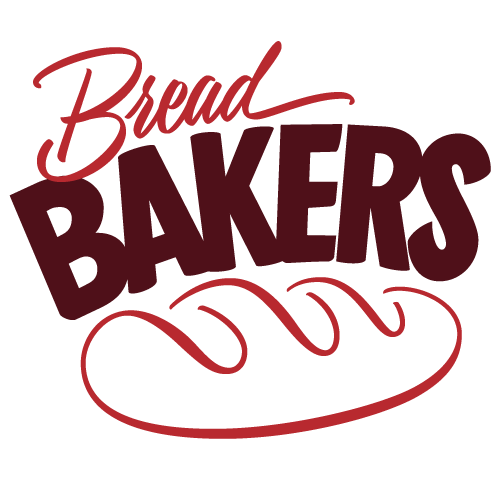 Tender Whole Wheat Bread from What Smells So Good?